Epitomizing the dream of becoming one of the greatest gospel musicians in the world, Joyce Blessing has over the years pulled herself by the “crupper” as a backup singer to a multifarious award winning gospel minister. Joyce Akosua Blessing, known by the populace as Joyce Blessing was born to Mr Christopher Kwabena Twene and Mrs Gladys Yaa Kyewaa on 15th May At Accra. Though a bono by tribe, she grew up with other siblings who were all raised by their mother in the Ashanti Region where she had her primary school and JHS education. Joyce had always had an endearment for music and hence started singing in the church at an early age of 14 and also made sure she never missed musical concerts held at her vicinity when she was young even when her mother tried to prevent her from attending these functions. Joyce Blessing is one gospel performer who has arguably disabused the stigmatized notion that gospel musicians are inactive on stage. She sharpened her live performance artistry when she was part of the “See Them Band” group in Kumasi where she played for five years aside being a backing vocalist for the likes of Evangelist Diana Asamoah, Jewel Ackah, Mary Ghansah, Ernest Opoku Jnr, Aseibu Amanfi and a host of other great musicians. The unbreakable singer Joyce Blessing shot to fame in the year 2013 after she unleashed her “Monko Moakyi” song,a single off her Heavy Price album comprising of other hits singles like , Kantamanto Nyame, Nyame Aguamma and more under the management of Media Excel Productions and ended the year on a glorious note winning several awards at the Adom FM organized Ghana Gospel Industry Awards. Joyce who has eight awards to her credit progressively worked hard and again won five meritorious awards in the 2014 Gospel Music Awards. She bagged herself nominations for seven categories and won five (5) including; The Best Vocalist, Popular video, Artist of the year, song of the year and Album of the year. She also made her first entry into the ultimate Ghana Music Awards in 2014 where she grabbed nominations for Gospel Song of the Year, Best Female Vocal Performance, Gospel Artiste of the Year, Album of the Year and Best Collaboration of the Year categories, with her “Heavy Price” album. The gospel crooner has graced so many reputable platforms in Ghana and abroad as well with her implausible stage artistry which always leaves patrons in nostalgia. In 2015, her management Media Excel Productions handed her over to her husband Dave Joy where she was managed under Dave Joy Productions and released her 5th Studio album “Agyebum” in April 2017 which earned her several nominations in the 2017 National Gospel Awards and an award at the 2017 4syte Music Video Awards for the Gospel Music Video with her visuals shot for the "Lord's Prayer". 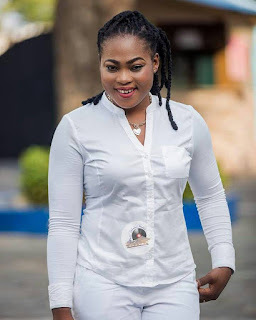 Joyce Blessing, a mother of two boys is currently signed to one of Ghana’s reputable record label “Zylofon Media” and looking forward to excel greater than before.